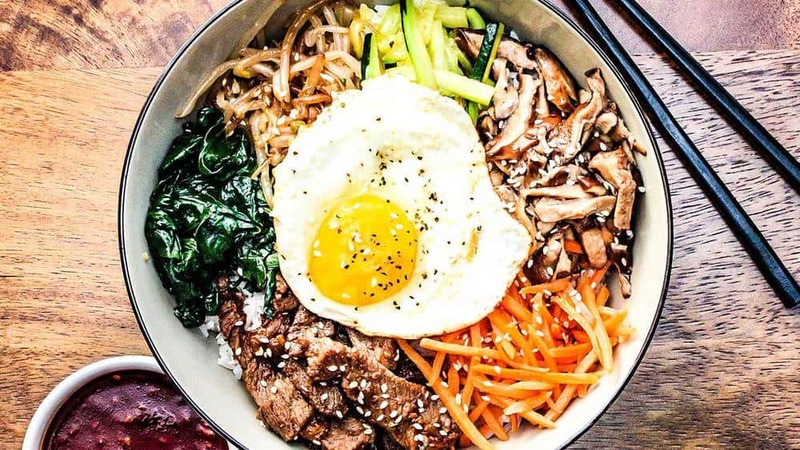 Authentic Bibimbap is such a spectacular dish. It is without doubt one of our favorite bowls of food ever. It’s Korean comfort food at its very best. 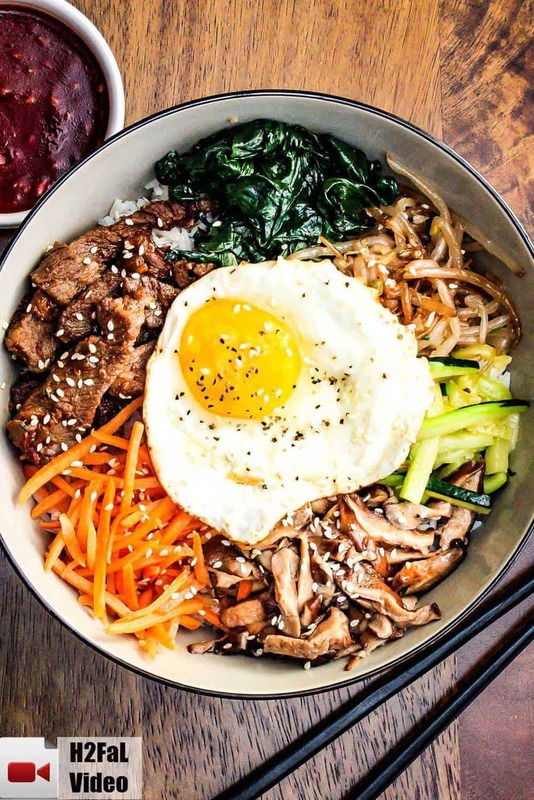 There is a reason Authentic Bibimbap (pronounced: BEE – beem – bap) is one of the most popular dishes served in Korean restaurants all over the world…it’s amazing! Watch us show you how easy (and fun) it is to prepare Authentic Bibimbap! We love pulling out our beloved seasoned wok and cranking up the heat to full throttle on the stove to get the wok scorching hot. When working with a wok, it is important to use a wok ring to make sure the wok stays in place on your stove. Quickly stir frying the veggies and steak make Authentic Bibimbap come together very quickly. 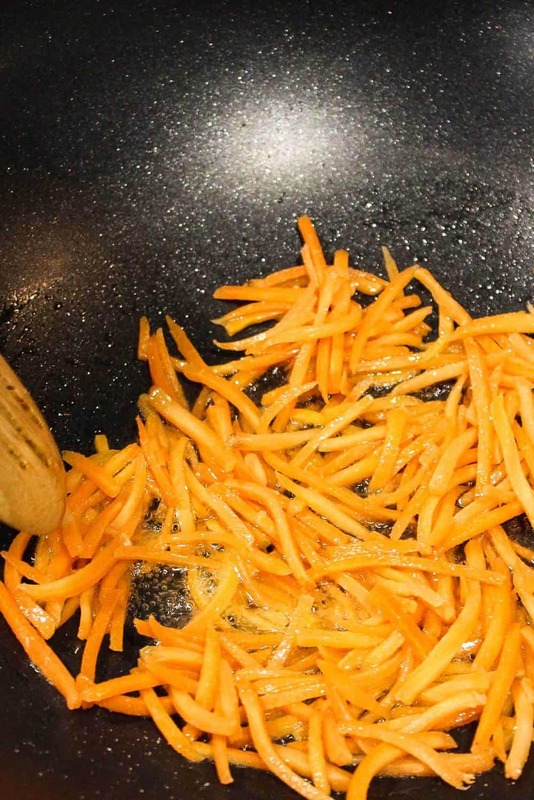 We love stir fried carrots! After you have stir-fried each component of the dish, place in a bowl, wipe out your wok, and quickly stir fry the ingredient. 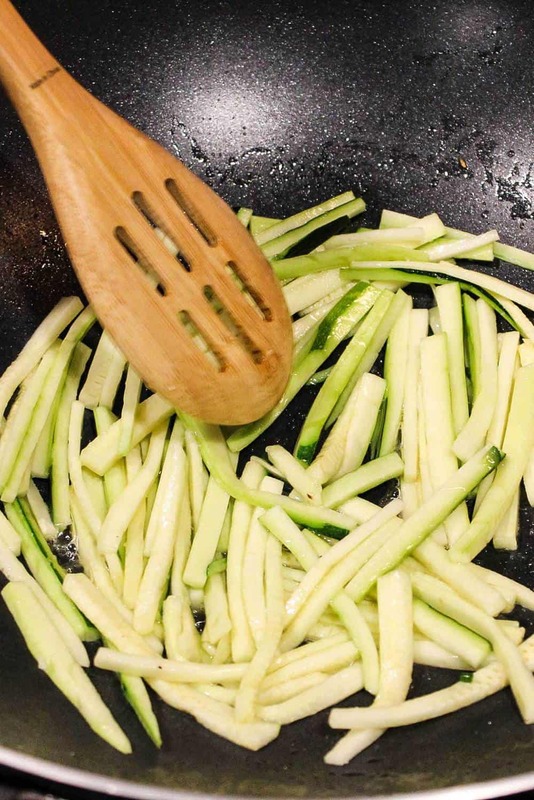 Zucchini is a traditional ingredient in authentic bibimbap. 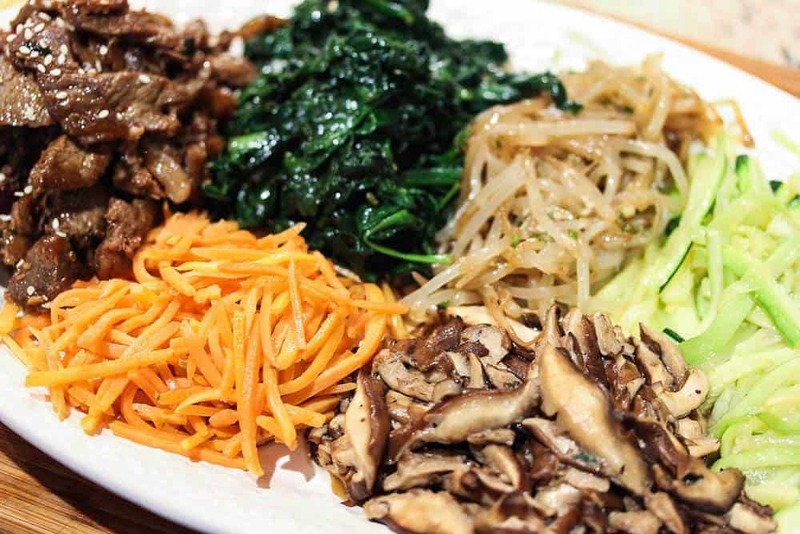 Fresh spinach is another staple in authentic bibimbap. Within a few minutes, it wilts and is so delicious. A touch of garlic, soy sauce and sesame seed oil is the perfect addition. And of course, there is the incredible steak, called bulgogi. You can easily prepare the marinade for the bulgogi beef ahead of time, or you, if you’re pressed for time, you can simply stir fry the steak with soy sauce and sesame seed oil. We love using ribeye steak for the bulgogi. To slice the meat thinly, freeze the steak for about 20 to 30 minutes, then use a sharp nice to cut thin slices. 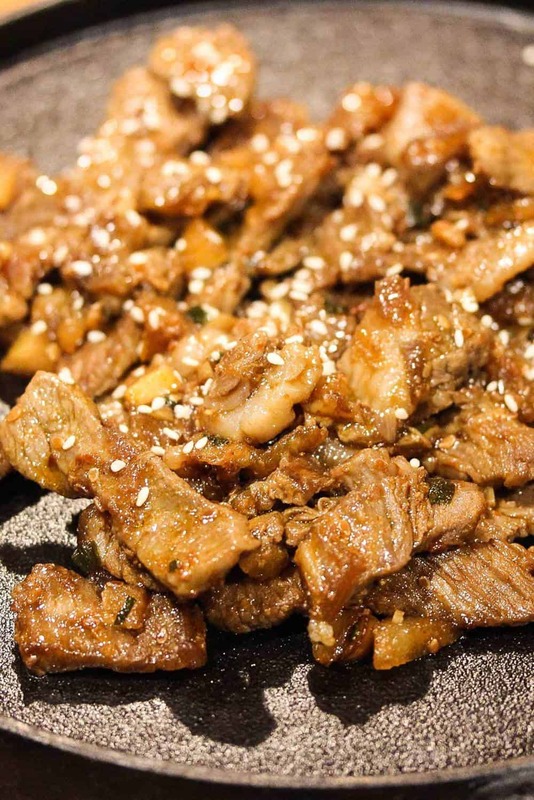 This is the traditional method for preparing Korean bulgogi. These amazing ingredients, plus a perfectly fried egg, sunny side up, are what comprise this incredible dish. They are delicious, and good for you, too! 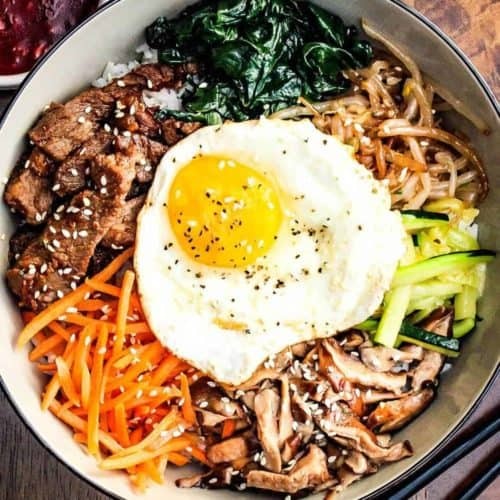 Steamed rice, served with a bounty of lightly seasoned veggies, and incredible Korean Bulgogi beef (go without the beef for a completely vegetarian dish), topped with a sunny side up egg, and finished off with a kick from the homemade Korean BBQ sauce. It may look daunting to make, but all the ingredients you can make ahead of time, and then just assemble on a bed of steamed rice, and you’ll have one of the satisfying bowls of food you’ve ever encountered. Traditionally, these are served in heated stone bowls, it really makes the experience that much better, and it continues to cook the rice, and even crisp it up. But, though you can order them online, they are bit tough to find. A nice large, wide bowl works just fine. Anyhow you do it, you’ll love it!! This Authentic Bibimbap is incredible. It's no wonder it's one of the most popular Korean dishes all over the world. Seasoned veggies, Korean beef (bulgogi), egg, Korean sauce, all on top of perfectly steamed rice. Make all the toppings first (can be done ahead of time, and just re-heated), then the rice...and serve with the homemade sauce. Wow, just wow. So good. Stir-fry oil or vegetable oil...for stir-frying all the ingredients as you go. Prepare the bulgoli, or stir fry beef with salt, pepper, and 1 tbsp each soy sauce and sesame oil. Set aside. Cook the bean sprouts in boiling water for 5 minutes. Drain, Place in a separate bowl, and add 1 teaspoon garlic, 1 tablespoon each of soy sauce and sesame oil. Mix. Set aside. Stir-fry the carrots in a little oil for about 4 minutes. Set aside. Lightly salt. Stir-fry the zucchini in a little oil for about 4 minutes. Set aside. Lightly salt. 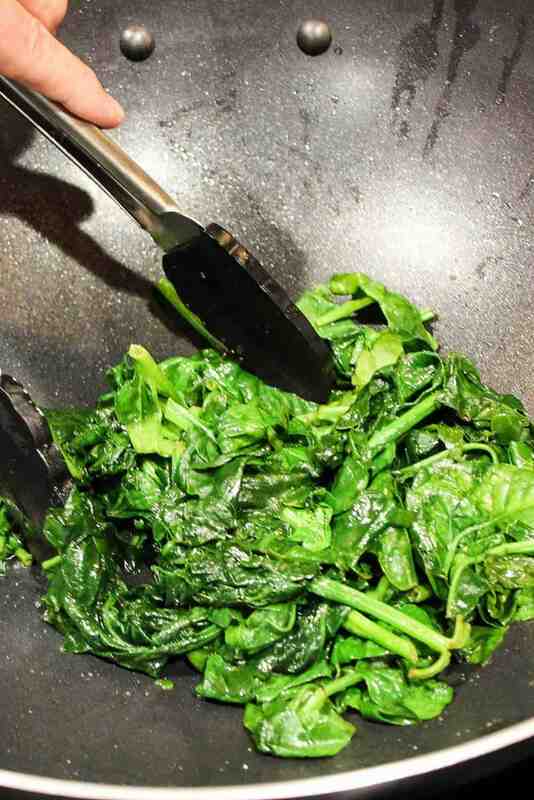 Stir-fry the spinach with a teaspoon of water until wilted and water has evaporated, about 4 minutes. Place in a separate bowl. Add 1 teaspoon garlic, 1 tablespoon each soy sauce and sesame oil. Mix. Set aside. Stir-fry the mushrooms with 1 tablespoon of soy sauce, until reduced and lightly browned, about 6 - 8 minutes. Cook 4 eggs, sunnyside up, add salt and pepper, set aside. Bring rice, water, vinegar, and salt to boil in medium saucepan over high heat. 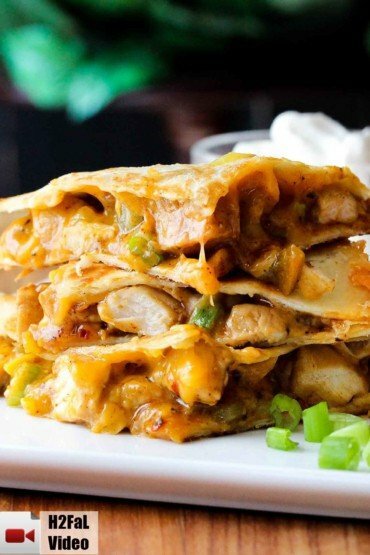 Cover, reduce heat to low, and cook until liquid has been absorbed, 7 - 9 minutes. Remove rice from heat and let sit, covered, until tender, about 15 minutes. (Cook time will be longer, approx. 25 minutes, if using long grain rice). Portion out rice into 4 bowls. Arrange toppings in a circular fashion. Top each with egg and then toasted sesame seeds.